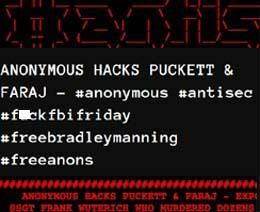 It's been a busy day for Anonymous, which in addition to publishing the FBI-London police telconference call, has hacked the website of the law firm Puckett & Faraj which represents Sgt. Frank Wuterich, the marine who recently got a sweetheart deal for his role in the Haditha killings. You can view Anonymous' message (not the e-mails) here. Haditha has been described as the My Lai of the Iraq War. 24 civilian Iraqis, including women, children and an elderly person in a wheel chair were shot in cold blood when Marines from Kilo Company (3rd Battalion, 1st Marine Regiment)went on a retaliatory rampage after a soldier had been killed by a roadside bomb. 1st Lt. Andrew Grayson was acquitted yesterday by a military juy on charges he covered up information from the Haditha killings. He was accused of telling a sergeant to delete photographs of the dead from a digital camera and laptop computer. Grayson, of Springboro, Ohio, was acquitted of two counts of making false official statements, two counts of trying to fraudulently separate from service and one count of attempt to deceive by making false statements. He would have faced as many as 20 years in prison if convicted of all counts. Charges against one of the Marines in the Haditha killings have been dropped, but it's not because he wasn't involved. Sgt. Sanick Dela Cruz, 24, had been charged with premeditated murder and making a false report in the November 19, 2005, deaths, which damaged U.S. prestige and led to international condemnation. ``Charges against him were dismissed on April 2 after the government balanced his low level of culpability in the alleged crime against the potential value of his testimony,'' a Marine Corps statement said. Two dozen Iraqi men, women and children were killed in this raid. Three Marines remain charged with murder and four others are charged with dereliction of duty for failing to properly report and investigate the shooting deaths of the two dozen Iraqi men, women and children. Was this deal really necessary? Why not make Dela Cruz plead to the dereliction of duty count? Why reward him with a complete dismissal? How trustworthy will his testimony be? 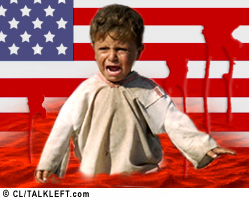 TalkLeft's prior coverage of the Haditha killings is accessible here. New documents have been released in the Haditha killings of 24 Iraqis by U.S. Marines. They are chilling. In a nutshell: After the roadside bombing in which a marine was killed, a white taxi with five unarmed civilians happened to drive by the scene. Staff Sgt. Frank D. Wuterich, the squad's leader, shot the men one by one after Marines ordered them out of a white taxi in the moments following the explosion, which killed one Marine and injured two others, witnesses told investigators. Another Marine fired rounds into their bodies as they lay on the ground. Bump and Update: Iraqis want the Marines charged in an Iraqi court. They fear they won't be held accountable in the U.S.
Update: Four Marines have been charged with murder. In all, eight marines have been charged with crimes in the Haditha killings. Bump and Update: Twelve counts of murder have been filed against Staff Sergeant Frank Wuterich who commanded the marine squad near Haditha when 24 people were killed. Staff Sergeant Frank Wuterich, who commanded a squad of marines near the town of Haditha in November last year faces 12 individual counts of murder and an additional count for ordering the troops under his charge to "shoot first, ask questions later", the charge sheet released to his attorney, Neil Puckett, said. The charges do not include premeditated murder, and Sgt Wuterich faces a maximum sentence of life in prison. Bump and Update: Charges will be announced at 4:00 pm ET. At least five Marines are going to be charged with crimes ranging from negligent homicide to murder in the November, 2005 killings of 24 Iraqis in Haditha. The 5 marines are said to have been the ones who killed the 24 Iraqis, including 5 men in a taxi that approached the marines’ convoy after the explosion that killed a 20-year-old lance corporal, and 19 other civilians in several houses nearby. About 10 of the dead were women and children who appeared to have been killed by rifle fire at close range, military officials said.